The City General Plan’s “50% preservation” requirement also extends to the third and largest property in the area, known as the Dalidio property (approximately 130 acres). Upon development of that property, an additional 65 acres wll be potentially added to the Agricultural Reserve. The ultimate size of the Reserve is therefore anticipated to be approximately 90 acres. CCG has been following the development plans of the San Luis Ranch and has offered suggestions and comments at each stage. CCG is particularly concerned about the developer’s proposal to remove up to two feet of topsoil from up to 52 acres of the land it is required by the General Plan to place into the Calle Joaquin Agricultural Reserve. From the outset we have found this proposal unacceptable for reasons presented earlier and elaborated below. At this point we are disappointed that this proposal continues to be reaffirmed in the DEIR, despite our objections and those expressed by the Planning Commission. CCG urges that the applicant be required to offer alternative plans for providing fill to raise the elevation of portions of its site and for dealing with possible floodwater drainage and/or detention requirements that does not involve either removal or disturbance of topsoil on portions of the property that are to remain in Agricultural Reserve. In both verbal and written presentations to the SLO Planning Commission in March 2016, CCG Treasurer Wendy Brown requested alteration in project’s cut & fill procedures, as well as other changes protecting water resources and requesting clarification of offsite mitigation proposals. Commissioner Malak shared concerns about 18-inches of topsoil and considered the idea of garnering fill from elsewhere. We take issue with the findings of this Agricultural Suitability Memorandum and on the statement of absence of Agricultural Impacts of the project it supports on several counts. First, it does not specify how much acreage will be affected and where on the project site it is to be located. However, a diligent search produces this information from section 4.8: “In total, earthwork for buildout of the Specific Plan area is estimated to require 817,200 cubic yards (CY) of cut, and 569,200 CY of fill, resulting in a need for approximately 248,000 CY of soil import.” Without further explanation, these figures don’t make sense: why would the larger amount of cut than fill require additional soil import? In any case, this is a projection of the removal of an unacceptably large quantity of topsoil. IV. Rejection of the applicant’s claim that the removal of the top two feet of topsoil has no Deleterious Effects on Agriculture and Ecology. This claim appears implausible on the face of it. However, the applicant presents a lengthy “Agricultural Sustainability Memorandum” from its hired consultant to justify it, a report approved and certified by retired Cal Poly Soils Science Professor Tom Rice, PhD(1981). We believe that the evidence and arguments presented to support the conclusion of this memorandum are fragmentary, contradictory, based on antiquated and discredited science and don’t take into account the organic agricultural practices that are required once the land falls under a conservation easement. In what follows we present testimony from a wide variety of sources to refute the Agricultural Sustainability Memorandum’s general claims that the removal of the top two feet of topsoil has no Deleterious Effects on Agriculture and Ecology. Dr. Cristina Lazcano, PhD (2010), current Assistant Professor of Soil Science at Cal Poly (http://nres.calpoly.edu/personnel.ldml?email=lazcano), author of 23 published articles and referee for more than 20 journals in the field (https://www.researchgate.net/profile/Cristina_Lazcano), in a separately submitted letter to the Planning Commission. The importance of soil organisms and their ecological interactions in the top 30 centimeters of topsoil has recently become recognized as crucial for agricultural productivity, regenerative fertility and general environmental health, including carbon sequestration that mitigates greenhouse gas emissions. This recognition has come along with the realization of the limits and long term dangers of excessive inputs of synthetic fertilizers. On the basis of my knowledge and research and that of colleagues in my field, I must strongly disagree with the idea that any removal of topsoil, let alone to the depth two and a half feet, would be without serious long term negative consequences for the farmland in question. Were such removal undertaken it would require massive inputs of compost and many years of intensive soil restoration practice to recover soil fertility, before the soil could be considered suitable for organic farming. I strongly urge you to require the applicant to find alternative sources of fill for construction on sections of the property in question not reserved for agriculture and to find alternative solutions for drainage that will not involve the waste of precious soil resources now to be found there. The loss of topsoil, either by actual removal with heavy equipment or erosion by wind and water, is the worst on-site damage in urban areas. This layer of soil has the highest biological activity, organic matter, and plant nutrients—all key components of healthy soil. The on-site loss of this upper layer of soil nearly eliminates the soil’s natural ability to provide nutrients, regulate water flow, and combat pests and disease. Loss of nutrients and nutrient holding capacity, results in a less fertile environment for lawns and landscape plants. The organic matter and finer soil particles are responsible for soil fertility and are washed away first, leaving larger, less reactive particles such as sand and gravel. As organic matter is lost, soil density increases and compaction occurs. Compaction lowers the infiltration rate of water and reduces the available water holding capacity. This results in poorer growth of lawns, gardens, flowerbeds, shrubs, and trees, as well as making the site more susceptible to drought and requiring more frequent watering. Additionally, soil amendments such as fertilizer and pesticides cannot move into the soil and, instead, run off into nearby lakes and streams. Lower organic matter levels are also associated with weaker soil aggregates and therefore greater risk of further erosion and soil crusting. The surface organic matter is also the food source and habitat for beneficial microorganisms and insects. The loss of this material drastically reduces the soils natural ability to control disease and pest outbreaks, increasing the need for pesticides. These microorganisms are also key to removing or buffering toxic elements or contaminants. 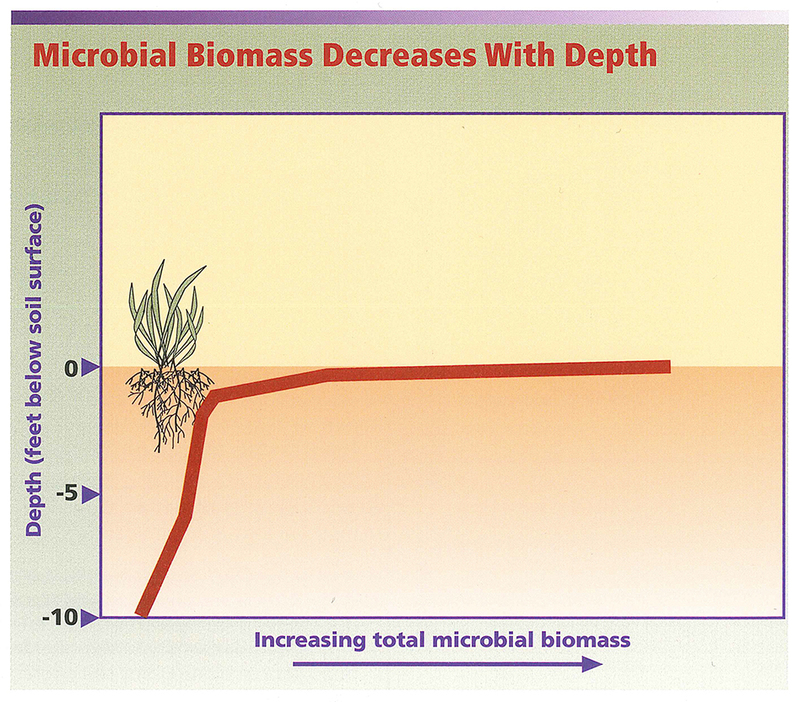 NRCS graphic representation showing how microbial life diminishes with depth. Besides the soil’s more obvious inhabitants, which include rodents, insects, mites, slugs and snails, spiders, and earthworms, there are countless microscopic residents, some helpful to man and his crops, some harmful. Good soils seem to hold the greatest populations of bacteria. Almost without exception, bacteria are involved in basic enzyme transformations that make possible the growth of higher plants, including our food crops. From man’s point of view, bacteria may well be the most valuable of the life forms in soil. Abstract: A field experiment was conducted on a Typic Cryoboroll (Site 1) and a Typic Cryoboralf (Site 2) in north-central Alberta, Canada, to determine the influence of simulated erosion (artificial topsoil removal) on loss in yield of hard-red spring wheat (Triticum aestivum L. cv. `Roblin’), and to determine to which extent fertilizers N and P will restore the lost crop productivity of two artificially-eroded soils. There were three depths of topsoil removal (0, 10, and 20 cm) as main plot treatments, and a factorial combination of four levels of N (0, 50, 100, and 150 kg N ha−1) and three levels of P (0, 9, and 18 kg P ha−1) as sub-plot treatments. Wheat yields at both sites were markedly reduced by increasing depth of topsoil removal. The erosion effects were more pronounced at Site 2 where average yield on the 20 cm cut decreased to less than half of that obtained under non-eroded conditions. At both sites, additions of fertilizer N and P to eroded soil increased wheat yield, but the yields did not match those obtained in non-eroded soil under the same fertilizer treatment. Plants growing on eroded soil responded differently to application of fertilizers N and P, not only in terms of yield but also in N and P concentration and uptake. The implication of these findings is that fertilization programs for fields with varying degree of erosion would require optimization of rates so as to restore yield and, at the same time, minimize nutrient losses (e.g., N leaching) and improve soil tilth. V. The Agricultural Sustainability Memorandum uses ambiguous, obscure and contradictory language. While acknowledging that “Organic matter and phosphorus concentrationsdrop significantly between the surface and sub-surface horizons,” the Memorandum maintains that the “surface horizon of a typical Cropley clay profile is 36 inches,” without indicating where in between those horizons the drop occurs or whether the typical profile applies to specific locations on this site. The study also asserts that “The northern field proposed as a floodway near U.S. Highway 101 may be farmed on the subsoil material,” again using the ambiguous language, “may be farmed,” which ignores the present exceptional agricultural productiveness of the land and refers to subsoil rather than topsoil. VI. Previous Activity at the Calle Joaquin Agricultural Reserve to remove subsoil and replace topsoil has had deleterious effects on agriculture, requiring expensive remediation by the City. Removal of topsoil without replacement at San Luis Ranch would have more extensive and more serious effects. As part of the development plan for the McBride property, the 13-acre open space portion was graded to avoid displacement of flood capacity. This was a City requirement imposed upon the project. This grading was performed in a manner that retained the top three feet of soil while removing approximately two feet of subsoil, and was done to retain a slope of 2% or less, 2% being the maximum slope considered acceptable for farming soils. Outcomes of that grading have since had two serious consequences. Pooling of water in the lower section of the fields in Winter 2015-2016 made farming impossible for several months for subtenants, Green Gold Organics, at City Farm and created a major factor for their terminating their lease and moving operations elsewhere. In an effort to remediate this condition on its property, the City of San Luis Obispo undertook the construction of a swale in order to drain pooled water away from the fields,improve its quality and conduct it toward Prefumo Creek, at a cost of $25,500. The success of this remediation effort remains to be seen. This example demonstrates the high environmental impact of changing the contours of agricultural fields in order to mine them for subsoil fill to raise the elevation of nearby land for the purpose of development. It does not take into account the much greater impact of using topsoil for that purpose, as proposed in the DEIR. We hope that this principle will serve to guide the developer to avoid the serious mistake of following the present plan to use the irreplaceable agricultural resource of fertile, living, precious topsoil as mere dirt. If not, we hope the City’s regulatory bodies will have the wisdom to prevent that from happening. This entry was posted on Wednesday, January 18th, 2017 and is filed under Miscellaneous, Politics, Sustainability. You can follow any responses to this entry through the RSS 2.0 feed. You can leave a response, or trackback from your own site.